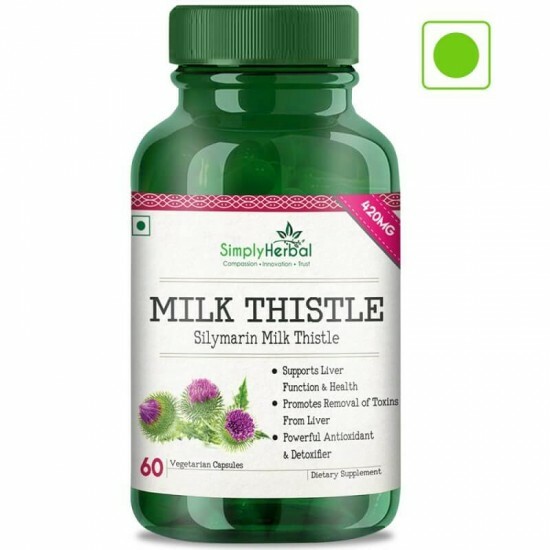 Simply Herbal Silymarin Milk Thistle Is a Powerful Antioxidant and Has Anti-inflammatory Properties Which Are Commonly Used to Detoxify the Body, Especially the Liver. Many of Us Have Turned to Detox Diets for Better Skin, Weight Management, and Energy Levels, but When It Comes to Cleansing and Detoxing the Body, the Liver Is by Far the Most Important Organ to Consider. The Liver Is Responsible for Purifying and Cleaning the Blood and Is Our Primary Defense Against Dietary and Environmental Toxins. When Toxins Begin to Accumulate in the Body, the Liver Becomes Inflamed, Causing Us to Feel Sluggish and Lethargic. As an Antioxidant, Milk Thistle Is Equally Powerful to Important Nutrients Like Vitamin E or Vitamin C, Which Help Fight Free Radical Damage. Promotes Liver Health Milk Thistle Helps Maintain Healthy Liver Function by Supporting the Structure of the Outer Cell Membrane of Liver Cells. 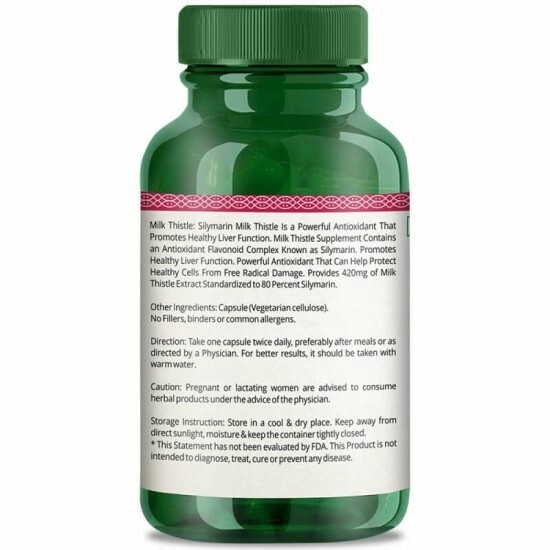 Effective Milk Thistle - A Highly Concentrated, Effective Extract of Milk Thistle. Powerful Antioxidant: Possesses Antioxidant and Free Radical Scavenging Activity. As an antioxidant, milk thistle is equally powerful to other important nutrients like vitamin E or vitamin C. Silymarin, the active ingredient in milk thistle, is an antioxidant that can protect against depletion of glutathione, which is a “master antioxidant” that’s extremely useful. 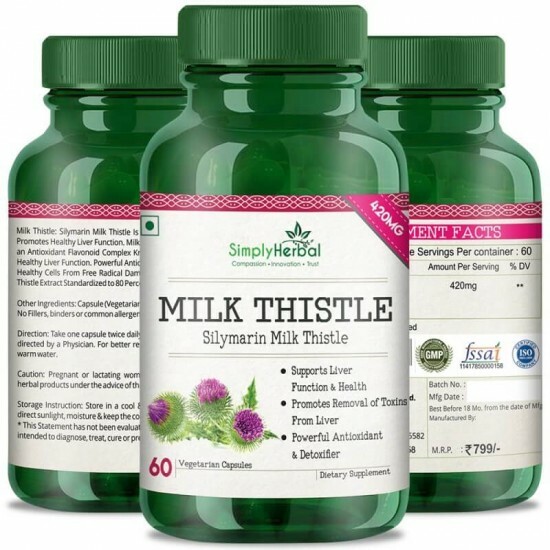 The seeds of the milk thistle plant contain silymarin; a group of three flavonoids called silibinin, silidianin, and silicristin that work together to strengthen the outer membranes of liver cells and reduce the number of toxins entering cells. This powerful antioxidant also stimulates protein synthesis, which helps to regenerate damaged liver tissues and reduce inflammation. Milk thistle is one of the most effective herbs at stimulating the production and flow of bile, which helps to break down excess fat and prevents it from accumulating in the liver. Bile is also essential for the elimination of toxins from the body. At Simply Herbal, every single product is produced with care, commitment and passion. To ensure our products are high-quality, effective, durable and compatible, we monitor the entire production process, from the choice of raw materials and packaging through to the finished product according to a defined inspection plan. Simply Herbal supports the Vegan Society. This means that no animal products are used in our range. We don't believe in using any animal for our products. This means that no animal products are used in our range. We don't believe in using any animal for our products. Simply Herbal products have been tested for safety and performance and are registered and comply with all regulations. Describe your products in three words: Quality, Innovation, Trust. How did you come up with the idea for this product? Our passion has always been to help people indulge and transform into what they aspire to be. So we decided to devote ourselves to give people the products they need to stay healthy and happy. In creating the brand, our intention has always been to create nature-intelligent formulas that go beyond what’s inside the bottle and transcend into rituals of transformation and self-care. What makes your product special? The two key ingredients that define our products are, Energy and Love! They are the key ingredients in every formula. Our holistic approach nurtures the mind, body, and soul. Our unique formulas and exceptional ingredients deliver immediate and long-lasting results. And we mean it. Our ingredients speak for themselves in their purest and boldest form. What has been the best part of your experience? Customers Happiness and their Safety is all we work for. This is the reason we get up every morning to pave a pathway to a better Life for our customers by creating products they trust for a healthy future. The immense love and support from our customers encourage us to go beyond and launch new products to cater to our customer's requirements.